A study, published today by the Zoological Society of London (ZSL), shows that just like humans love getting stuck into a crossword, chimpanzees get the same feeling of satisfaction from completing tricky puzzles. 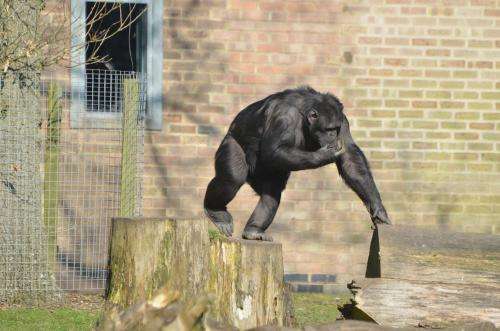 Scientists set up a challenge for six chimpanzees at ZSL Whipsnade Zoo using plumbing pipes from a DIY store. The challenge involved moving red dice through a network of pipes until they fell into an exit chamber. This could only be achieved by the chimps prodding sticks into holes in the pipes to change the direction of the dice. The same task was also carried out with Brazil nuts, but the exit chamber removed so that the nuts fell out as a tasty treat for the chimps. The paper was published today in the American Journal of Primatology. ZSL researcher Fay Clark says: "We noticed that the chimps were keen to complete the puzzle regardless of whether or not they received a food reward. This strongly suggests they get similar feelings of satisfaction to humans who often complete brain games for a feel-good reward." The adult family group of chimpanzees at ZSL Whipsnade Zoo consist of two females and four males, three of which are half-brothers: Phil, Grant and Elvis. This study allowed them to solve a novel cognitive problem in their normal social grouping, by choice. In addition, the chimpanzees were not trained on how to use the device. "For chimps in the wild, this task is a little bit like foraging for insects or honey inside a tree stump or a termite mound; except more challenging because the dice do not stick to the tool," Fay added. The challenge, which only cost about £40 to make, was made more intricate by connecting many pipes together, and the level further increased by making pipes opaque so chimpanzees could only see the dice or nuts through small holes. The chimps took part in the cognitive challenge as part of their normal daily routine and doing the brain teaser was completely voluntarily. As part of the Zoo's enrichment programme, they also receive tasty treats hidden in boxes, as well as pillows and blankets every night to make up their own beds. Chimps build their own nests every night in the wild, and this enrichment encourages the animals' natural behaviours. This study suggests that like humans, chimpanzees are motivated to solve a puzzle when there is no food reward. They do so for the sake of the challenge itself. It also suggests that chimpanzee cognition can be measured on social groups under more naturalistic conditions.